Destroy the body and the head will die. Far too often boxers will only target their opponent's head and neglect throwing body punches. This is a mistake. Hurting the body, while not usually immediately obvious or as satisfying, is a sure route to victory. To develop a complete offensive game, learn how to effectively throw body shots and body punches. HOW DO YOU KNOW YOUR BODY PUNCHES ARE EFFECTIVE? A knockout from a blow to the body is totally possible and happens quite often - you just don't see a lot because highlight reels tend to show the head shots that send boxers sprawling across the canvas while a well placed body shot simply crumples them to the mat. As such, they don't always make the ESPN recap. Your opponent will start breathing heavy. You'll begin to notice slowness both in punches and movement. Eventually, obvious signs of distress will appear- buckling over, shaky legs, inability to catch breath and knockdowns. Total knockout - if you get in a good one. While any punch to the body will do some damage, you will see more effects quicker by placing well targeted punches. Hit the liver - where to punch the body. Precision is the name of the game for the body. 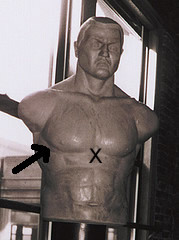 Pelvic bone, hipbone, abs - the body has bones and muscles that offer a lot of protection, while in other places there is little - sternum (marked as X in picture), under pectorals, ribs (marked by arrow in picture), liver. Hitting one of these prime targets can disable your opponent instantly or at least knock the wind completely out of him which will set you up for a finishing blow. The liver shot is a sure-fire knockout punch and boxers like Antonio Margarito are fans of hitting high up on the ribs in the armpit cavity. The body is generally well protected by the elbows and arms - at least in experienced boxers. Plus, getting in close enough to throw your punch without getting clocked in the head is always a challenge. Body punching is something you will require a lot of practice with to get good at. You actually bend over at the waist to throw a jab to the body ensuring you punch up into your opponent. If you were to crouch straight down and throw a jab to your opponent's body, you completely expose your head and against and orthodox fighter, you can be sure he will come over your jab and nail you with a straight right. So, to lessen the danger and to generate some power, you bend at the waist perpendicular to your opponent while simultaneously bringing your right hand up to protect the right side of your chin and burying your head in your shoulder and outstretched arm. Only the top of your head should present a target. Throw it and then recover just as quickly. It is all one fluid motion with a step toward your opponent. This will take some getting used to, but with practice your balance will develop and you will be able to get a little power behind it. This is a jab remember, it is not meant to knock out your opponent. It is meant to set something else up and you really should only use it against a hesitant boxer -- one who isn't initiating any attacks. It is a means of getting him to commit to something. You want to aim at your opponent's sternum, but the target can fluctuate depending on how his body is protected. There is a variation of this where you turn your body directly to the right (orthodox) or left (southpaw), bend over at the waist and then drive your jab toward your opponent as you bend. This is very similar to throwing a jab to the body except you bend forward and down while you twist at the hips like you normally would for a straight right. You can get some pretty good power with these punches as you get the added benefit of gravity. Your punch should never go down, but hit at an upward angle just like the jab to the body. Be sure to keep your left hand high and ready to block any counter and watch for an uppercut as you bend over. If your opponent sees you start to go for the body, any kind of uppercut could hit you as you bend over into it. Also be careful on the recover. Try moving as you come back up so you don't put your head back where it was when you went down. When we react to enemy fire in the army, we hit the ground and roll before coming back up to return fire. Looking through a scope if you see where someone went down, it's easy enough to wait for them to come back up in the same spot. Rolling over forces the enemy to re-aim and it's the same basic principle in boxing. The punch itself is thrown just like a regular straight right. You transfer the weight from the back to the front while snapping your arm out and back in a straight line from your chin. You are aiming for the sternum - about two inches below the center of the chest where the rib cage comes together. If you've ever had the wind knocked out of you, you'll know why. The left and right hooks to the body are devastating. You can put a tremendous amount of power into them and they are exactly like throwing them to the head except you bring your arm down instead of up. However, you have to get in close enough to land your punch. To do so, jab your way in, slip left, then throw it. It will place you in a good position to land a precisely placed punch either directly to the ribs or upwards underneath your opponent's right pectoral. Hit too low and you'll nail his hipbone/pelvic bone which is hard and will not do too much damage. Place your punch in the fleshy, unprotected rib/pec region and he is going to feel it. In all the punches watch the positioning of your rear foot. If it is 90 degrees to the way you are facing (turned too far outwards) you run the risk of tearing ligaments in your knee, especially if you slip and your knees buckle. Maintain your stance with your feet turned out at 45 degrees. This will let your knees bend in a more natural way and prevent injury. It is highly likely there will be an elbow in front of your intended target. If your straight right is going to end up hitting an arm, then try looping around instead of throwing it straight out. As I mentioned before, worry less about power in your body punches and more about precision. Deliver enough powerful little blows to the right spots and the fight will turn in your favour. At all times be aware of how you expose your head and try to compensate either by blocking with the hand not throwing or by movement. A combination of the two works well as well. Body shots, as most punches, should always be thrown as the start of combinations. Try practicing throwing two left hooks to the body followed by a straight right to the body or mix it up and throw a body shot followed by a head shot followed by a body shot. Never think of it as a one punch deal. ...and don't neglect your opponent's body. Work it hard.